The Philippines is closer than ever to a dream it had always nurtured. 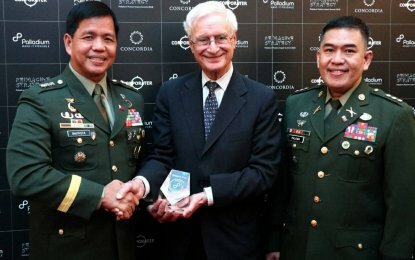 Last March 15, 2018, the Philippine Army (PA) received the Palladium Balanced Scorecard Hall of Fame for Executing Strategy during the Reimagine Strategy: Palladium Positive Impact Summit 2018 in London after it was deemed as one of the best organizations to incorporate strategy and execution into their missions. Lieutenant General Rolando Joselito Bautista was present during the ceremony to receive the award from the vastly recognized Palladium Balanced Scorecard Hall of Fame organization. Bautista even announced that the Palladium award was proof that the PA has exerted maximum effort in creating a “functioning and world-class strategy”. "We promise to continue the journey so that we will be better of service to the Filipino people as a transformed Army they can truly be proud of,” Bautista said. With him during the awarding was Head of Army Governance and Strategy Management Office Colonel Joel Paloma. The PA deserved the award after it successfully complied and passed the on-site evaluation test conducted by Director of the Office of Strategy Management of the Palladium Group David McMillan last January 22 to 24, 2018. Part of the successful evaluation is the PA’s compliance with the Army Transformation Roadmap strategy since 2010 through the use of Kaplan and Norton strategy management system. In Bautista’s view, the Palladium award has brought the PA closer to becoming a world-class army by 2028 since the awarding body is recognized for inducting over 200 organizations worldwide since 200 and setting the standard for strategic performance management.